To compare the performance of the algorithms proposed by the Fetal Medicine Foundation in 2012 and BCNatal in 2013 in an Italian population. 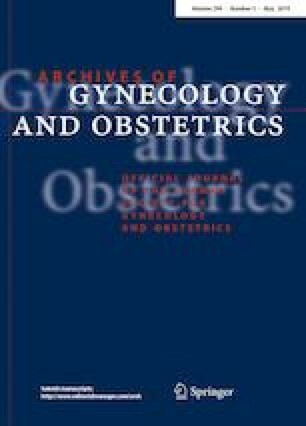 A multicentric prospective study was carried out which included pregnancies at 11–13 weeks’ gestation from Jan 2014 through May 2017. Two previously published algorithms were used for the calculation of the “a priori” risk of preeclampsia (based on risk factors from medical history) in each individual. In a study population of 11,632 cases, 67 (0.6%) developed early preeclampsia and 211 (1.8%) developed late preeclampsia. The detection rates (95% CI) for early and late preeclampsia were 58.2% (45.5–70.2) vs. 41.8% (29.6–54.5) (p value < 0.05) and 44.1% (37.3–51.1) vs. 38% (31.3–44.8) (p value < 0.05) for the Fetal Medicine Foundation and BCNatal, respectively (at a 10% false positive rate). The associated risk was 1:226 and 1:198 (p value ns) for early PE, and 1:17 and 1:24 (p value ns) for late PE for the Fetal Medicine Foundation and BCNatal, respectively. The Fetal Medicine Foundation screening for preeclampsia at 11–13 weeks’ gestation scored the highest detection rate for both early and late PE. At a fixed 10% false positive rate, the estimated “a priori” risks of both the Fetal Medicine Foundation and the BCNatal algorithms in an Italian population were quite similar, and both were reliable and consistent. DDM protocol/project development, data collection, manuscript writing. BM protocol/project development, data collection. SP, BB, FG, VG, GP and LC data collection. PC protocol/project development, data collection, Manuscript writing. FP protocol/project development, data collection, manuscript writing, data analysis. CG data collection, manuscript writing. DM protocol/project development, manuscript writing. FF data collection, manuscript writing. MC, TT and NR manuscript writing. AF protocol/project development, data collection, manuscript writing, data analysis.